Guns today are looking more and more like they’re from a video game or something. 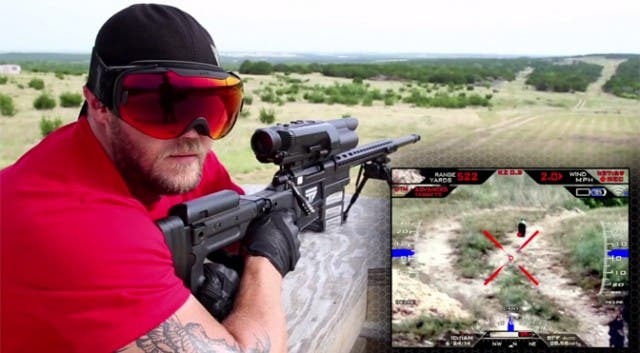 Take TrackingPoint’s latest Precision-Guided Firearm (PGF) – a sniper rifle that allows the user to tag targets so that the gun will come off only when the tag is in scope. Actually, considering the rifle doesn’t actually have an optical scope, but a highly advanced video display and recording device, it would be more technical to call it a computer assisted semi-automatic rifle. You can also use the display to render images from a remote camera, so you can track targets and eventually hit them as they come around the corner without ever having to be in their line of sight. Crazy stuff. Basically, almost anyone could become an expert marksman using this rifle, that’s if we’re to believe the cowboy promo video from TrackingPoint. All of the rifle’s super smart aiming and features are controlled by a ballistic internal computer which takes into account numerous factors like distance, ammunition, barrel condition. The sniper only needs to manually adjust for wind speed. Poor deer doesn’t stand a chance. Speaking of which, rant time. The PGF is marketed as a hunting rifle – an ultra-tech, semi-automatic, Call of Duty hunting rifle. Personally, I feel hunting for sport shouldn’t have a place anymore in a modern, 21st century world that places humane values at heart. Using this rifle for hunting seems even more sick to me, since it tarnishes whatever trace of sport there was left. Even more frightening is the prospect that anyone can buy this rifle in the United States. Sure, there $10,000 price tag will keep away most people, but there are wealthy psycho killers out there too. Aside from hunting, SWAT teams and the military might find this rifle very, very much useful. The US army has already purchased six units according to TrackingPoint. ZME readers, will we be seeing more smart guns like the PGF rolling out in the future?